Slowly finishing the last details of my patio I'd thought I tell you a bit more about how things are going. 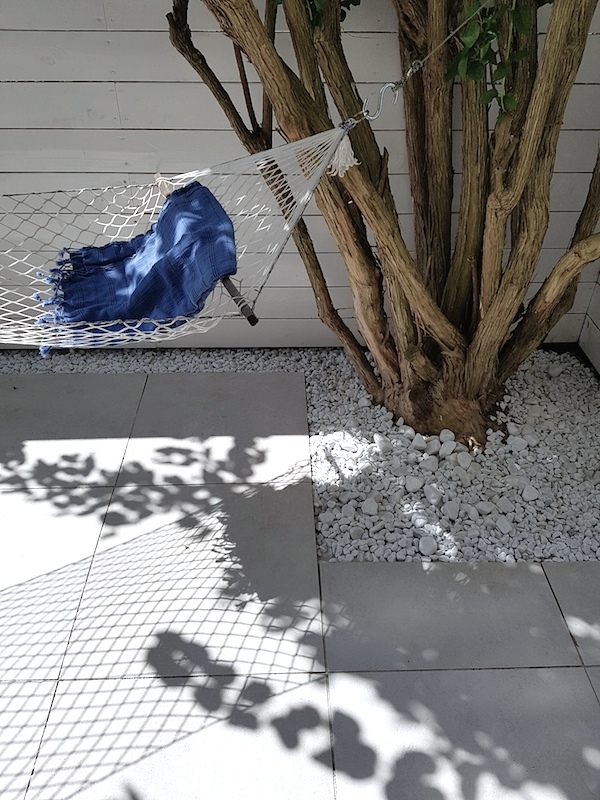 I guess a real patio should have stone walls and should be more enclosed but as I thought to keep it a bit friendly for my neighbours I choose for a wooden fence and simply painted it white like the walls that partly surround my outdoor space. Last month I showed you my patio wish list which off course is the most fun part as the whole process took way longer then I expected it to be. And yes I did enjoyed some sun in my old hammock while still working on finishing things. I started with building up a wooden fence last Summer which was the easiest part as I got some help with that, to show you how it looked before, quite messy and a bit hilarious I'd say, I added some pictures on facebook. After the fence was build I waited a few days for good weather and to be sure the wood would be dry before painting, quite a task living in the Netherlands I tell you! Next sanding and the first layer of stain, I added a total of 3 layers with some light sanding in between and it went really easy. I used CetaBever tuinbeits (garden stain), the main advantages of stain is you do not need to prime first and you will always see the structure of the wood. CetaBever Garden Stain is available in transparent and opaque colours, and the opaque stain is also to mix in a lot of different colours, I went for opaque white to create a white fence. I was happy to get some really good advice on the website of CetaBever, but you may also directly call or email the technical departments at the moment you can not cope (Just ask anything via doehetzelf.tv@akzonobel.com) As you can see I could not resist adding some green before finishing up, which immediately learned me I need some good pots with our rainy weather. Choosing the right tiles for the space was not that easy, I started looking at concrete tiles as I thought they would blend in with the grey floor inside my home. But to be honest I thought they were all looking a bit too rough and decided to find a store with a wider range of tiles. KOL Tegels in Haarlem sells tiles for almost every use, looking at one or two tiles only is something completely different then seeing a complete wall or floor. The large store has a kitchen and bathroom department and in the many small sections different wall and floor tiling is showcased including my favourite, an amazing wall of shiny black and golden tiles. 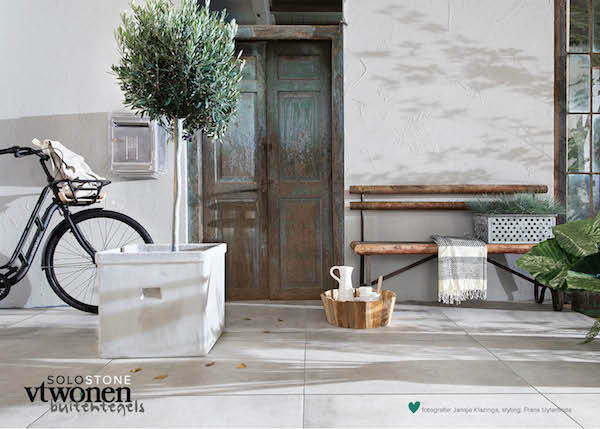 Next to the indoor tile collection KOL has an impressive collection of outdoor tiles, including the complete 'vtwonen outdoor' tiles I had seen in the magazine and tv show. Vtwonen tiles are sold at a few selected stores only, and available in different colours from almost white to black and with different patterns to mix and match. The collection is recently extended with an all new XL 92x92 tile, see more of the collection and all colours here. 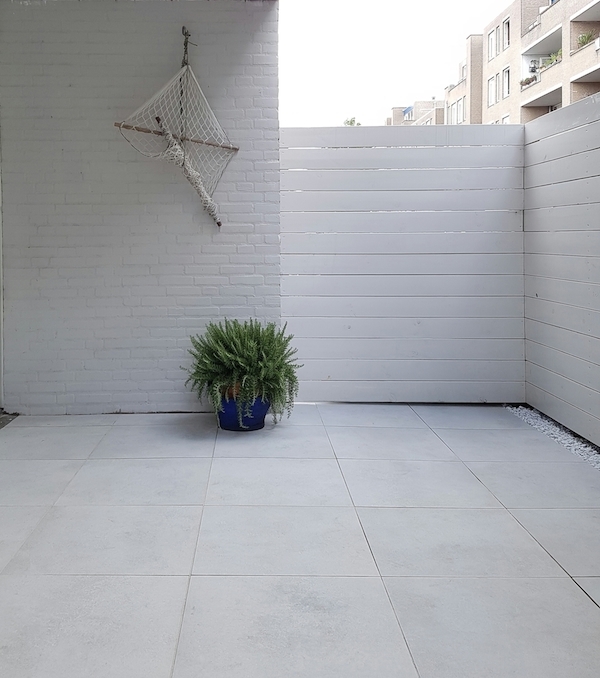 At KOL I was lucky to find the entire collection in the Haarlem store including the 60x60 duostone Hormigon cream I chose for my own patio. They are so pretty and being almost white they bring lots of light into my home, especially when the sun is shining.